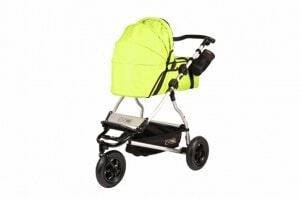 The Mountain Buggy Swift is a smaller version of the very popular and agile Mountain Buggy Urban Jungle. If you really want all-terrain capabilities in a smaller package that is quite city or suburb-friendly, the Swift is a great option. This zippy little stroller really is quite swift. There’s not much that will slow it down, short of a red light. It will zip right over anything in it’s path- broken sidewalks, curbs, rocks, mud, mulch, tree roots, you name it. Just like it’s larger Mountain Buggy counterparts, the Swift can take any terrain- city or country, sidewalk or park- with complete ease. The Mountain Buggy Swift comes complete with the standard Mountain Buggy full recline, standing fold, adjustable handlebar, super easy to adjust 5-point harness, lockable swivel front wheel, detachable bumper bar, great canopy with peekaboo window and pop out sun visor, bottle holder, easily flippable foot brake and is car seat or carrycot compatible. The differences lie in the overall size. The frame is slightly narrower and weighs a bit less, about 4 or 5 pounds less than the Urban Jungle. It’s not a compact carry it on the subway every day while holding your baby sized stroller, but you really don’t need it to be. This is not your go on the bus stroller, this is the stroller you get to go everywhere else you want to be. The Swift can take you and your baby, toddler or even Kindergartener to the park, shopping, for long walks, city or suburbs. At just about 20 pounds, it’s light enough to easily tote up the stairs or take in and out of the car as often as you need. It will go anywhere you want to roll, giving you a super easy push (no fighting over cobblestones or shoving stuck little tires through wet grass in the park) and a very smooth ride for your child. The wheels are slightly smaller and it lacks the rear suspension of the Urban Jungle or Duo, but still offer a great ride in all conditions. I tested the 10” Swift wheels over all of the terrain that I take my Duo a daily basis and really noticed no difference. Everywhere I went the Swift handled it with ease, even with my 45 pound 5 year old on board. My son, was not only as easy to push as a newborn in this stroller, he said he loved riding in the Swift. Though not an avid stroller rider, he asked to keep going for a very long ride and then asked for another ride as soon as we returned home. It was great that I could easily carry the stroller down our many front steps and still push a 45 child over even the roughest terrain. We went up very steep grassy hills, popped one-handed over tall curbs, trotted over very uneven sidewalks that stop many other strollers dead in their tracks. Despite the smaller size, the Swift holds a whopping 77 pounds and has a seat that will hold your taller children easily. You can easily use the Swift from birth straight through to your post-stroller days and unless you really need an extra tiny umbrella-sized stroller for public transport, this can easily be your only stroller. The Swift is available in 3 colors- Lime, Chili and Flint. I tested the Lime and it is very cute. One of my favorite things about the Swift is the shot of color in the seat area and inside the canopy. It has a nice, practical black with a great shot of lime green to give is a happy little pop for your child. The seat material is a hard wearing 600D polyester fabric, water repellent and durable, so it will hold up no matter where you push or or what your child drops in the seat. Available accessories include the carrycot, car seat adapter, travel bag, sun and rain covers. Also available are the Mountain Buggy universal accessories, such as the lovely seat liners and sleeping bag. 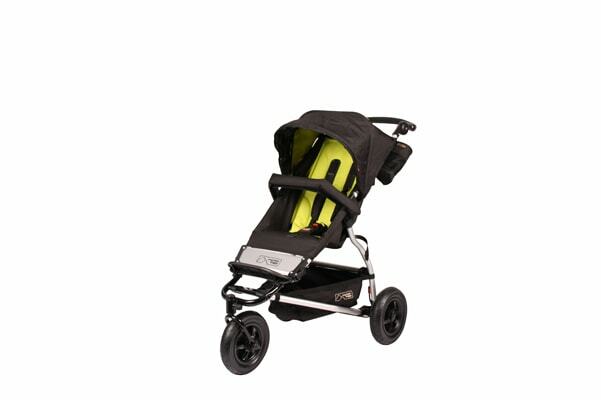 I love it- hard-wearing and hard-working- the Swift really can be your go to stroller no matter where you are. Now through January 10, 2011, Mountain Buggy is including a free carry cot with purchase of selected mountain buggy strollers, so please visit the mountain buggy site for more details.